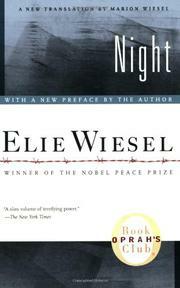 Elie Wiesel spent his early years in a small Transylvanian town as one of four children. He was the only one of the family to survive what Francois Maurois, in his introduction, calls the "human holocaust" of the persecution of the Jews, which began with the restrictions, the singularization of the yellow star, the enclosure within the ghetto, and went on to the mass deportations to the ovens of Auschwitz and Buchenwald. There are unforgettable and horrifying scenes here in this spare and sombre memoir of this experience of the hanging of a child, of his first farewell with his father who leaves him an inheritance of a knife and a spoon, and of his last goodbye at Buchenwald his father's corpse is already cold let alone the long months of survival under unconscionable conditions. The author's youthfulness helps to assure the inevitable comparison with the Anne Frank diary although over and above the sphere of suffering shared, and in this case extended to the death march itself, there is no spiritual or emotional legacy here to offset any reader reluctance.